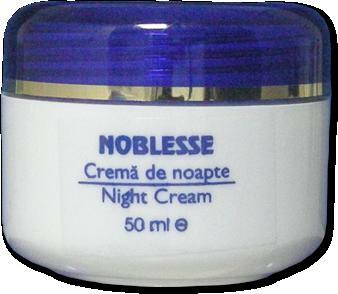 COMPOZITIE Crema de noapte Noblesse : Aqua - Polyisobutene - Glycerin -Cetearyl Alcohol - Caprylic/Capric Triglyceride - Ceteareth 15 (and) Glyceryl Stearate -Myristyl Myristate - Aloe Barbadensis Leaf Juice - Simmondsia Chinensis (Jojoba) Oil - Methyl Glucose Sesquistearate - Serine (and) Mannitol (and) Arginine (and) Sucrose (and) PCA (and) Alanine (and) Glycogen (and)Histidine HCl (and) Threonine (and) Glutamic Acid (and) Lysine HCl Urea - Butyrospermum Parkii (Shea Butter) - Dextrine (and) Soluble Colagen - Phenylalnine, Aspargine - Propylene Glycol (and) Diazolidinyl Urea (and) Methylparaben (and) Propylparaben - Parfum - Tocopheryl Acetate - Retinyl Palmitate - BHA. CONTRAINDICATII Crema de noapte Noblesse : nu s-au constatat. MOD DE UTILIZARE Crema de noapte Noblesse : Se aplica in strat subtire seara, inainte de culcare, pe pielea curata si uscata. Este conceputa ca o crema grasa care ajuta la hidratarea pielii in timpul noptii.